Seasonal wetlands are flooded in the winter and begin to dry out in the summer. The moisture content of these biomes changes seasonally as opposed to a daily cycle. Rains (and snow in colder areas) arrive in the winter and begin to fill the area with water. With the arrival of water, insects, reptiles, birds, and small mammals populate the wetlands. As spring arrives, the plants in the wetlands begin to grow and bloom, providing an additional food sources for the residents. Crustaceans such as shrimp and bivalves that include clams feed on the insect larvae and detritus. Shorebirds then come in to feed on those animals. As summer approaches, seasonal wetlands begin to dry out. The green colors of spring turn to tan and the populations change as some small animals move deeper into the muddy soils. Birds migrate to new areas and other small animals die off, but leave eggs that will hatch when the next rainy season arrives. Marshes are some of the most common and widely distributed wetland habitats. You will often find plants that are characterized by soft-stemmed reeds, rushes, and grasses. Even though the plant root systems are underwater or in the soggy soil, you will see their leaves and stems. Marshes are very important for birds such as ducks and geese as they migrate and breed. 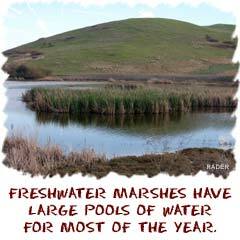 Freshwater marshes are flooded for most of the year. Winter brings seasonal rains and snows that raise water levels for the remainder of the year. You will find many grasses and reeds as the major plant type in these biomes. Animals above water include birds, insects, and mammals such as mice or raccoons. Below the water's surface, you will find small fish, crustaceans, and a variety of worms working their way through the dead vegetation. Sometimes freshwater marshes dry out during long or excessively hot summers. During these dry times you will still find small pools of water that are home to larvae and small plants. Even if the surface is dried out, there may still be a great deal of water below the surface in a muddy environment that is home to many bacteria and microscopic organisms. 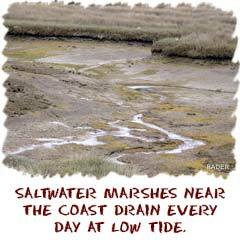 Saltwater marshes are unique because they receive new water every time the tide moves in. As the tides rise, the saltwater marshes fill with water, covering the muddy bottom. As this clean saltwater moves in, the marsh population can feed off small organisms in the water. You will find barnacles, clams, mussels, and crabs across these biomes. You will also find a variety of fish that feed on the incoming plankton and small shrimp in the water. These fish then become a food source for shorebirds and waterfowl that make their home in the marshes. As the tide goes out, fish and birds move to deeper water areas while clams and mussels close up for the day. During this low-tide period, you may see small mammals (raccoons or possums) digging through the mud for arthropods and bivalves that would provide a quick meal. Bogs can be found in locations that are cold and acidic. Acidic water pools in flat shallow areas that are located near coastlines where the environment receives a great deal of moisture. Swamps are wetlands that have forests. Marshes don't have large trees, but swamps do. Many swamps are found in Florida and Australia. These trees and shrubs provide a unique wetland habitat for birds and animals. The areas offer plenty of food and protective cover that are good to hide young mammals and fish from predators. In addition to birds, you may also find larger animals such as deer and alligators.